Not Dead Yet, a national disabilities rights group, and the Alliance Center for Independence led the most recent protests against Singer, and a YouTube video of their protest shows cars stacking up as police spoke to activists, asking them to get out of the street. An advocate for euthanasia, infanticide, physician-assisted suicide and embryo experimentation, Singer outspokenly champions his own brand of medical “ethics” that many members of the disabled community find objectionable. Moreover, in his book “Unsanctifying Human Life,” Singer writes that some members of our species, specifically the disabled, should not even be classified as human. And in April Singer argued that it is “reasonable” for government or private insurance companies to deny treatment to severely disabled babies under the Affordable Care Act, or Obamacare. Singer has also written extensively on the topic of “animal liberation,” and theorizes that it is worse to kill some animals than it is to kill disabled humans. Singer also believes animals are equal to humans. Not Dead Yet and the Alliance Center for Independence plan to continue to protest Singer. Its leaders say they are not going to let the issue die. “We would like to have a meeting with the president of Princeton, we are continuing to write letters to the editor to get some publicity on this issue, and we would like to meet with the student newspaper at Princeton,” Luke Koppisch of Alliance Center for Independence told The College Fix. “This is a big issue and we want people to be aware, especially Princeton alumni, donors, and contributors,” Koppisch said. 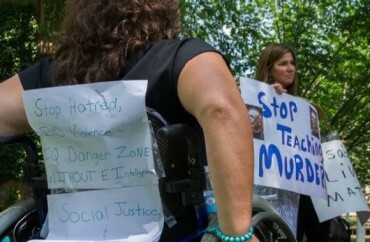 Norman Smith, co-founder of Project Freedom, an organization that makes independent living possible for disabled individuals, has also been vocal in protesting Singer. “Peter Singer is devaluing the lives of millions of people based on the fact that we have disabilities. He judges our lives to be less worthy and of less quality. He is teaching this hate to future leaders of America in an academic vacuum with little knowledge of real people with disabilities without any balancing input. If he said similar things about a particular race, color of skin, religion, or national origin, Princeton University would not be hiding behind the cloak of academic freedom,” Smith said in an email to The College Fix.